All the useful information that you need to know before sending money with Remit Money! Launched in the year 1994, RemitMoney has been backed by one of the largest private sector banks of India, Axis Bank. The company has been operated from Mumbai, India that specializes solely in transfer to India. It is providing its specialized services to the Non-Resident Indians, who want to send money to their families and friends in India. 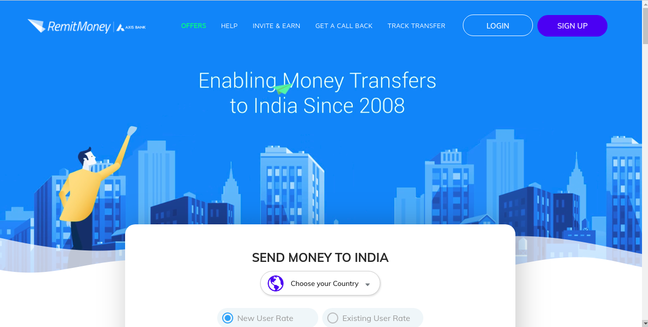 RemitMoney offers funds transfer from 9 major countries which include the UK, the US, The Euro Zone, Australia, Singapore, UAE, South Africa, Switzerland, and Canada to India. Only Indian citizen or OCI/PIO holders can use the services of the company to send money to beneficiary in India (any bank account). The company is not offering spot transfers or forward contracts, but supports bank account to bank account transfer. Remit Money rolls its fee as well as taxes in the fee, so that the price won’t change once you make the transfer and an exact amount received by the recipient as shown during transaction. It has also been providing high security as any other bank, so customers can send their money without worrying about hampering privacy. Pricing : How much does Remit Money cost? Axis Bank RemitMoney does not charge a single penny for transferring the funds. So, NRIs who want to send money to their families and friends can send through it without worrying about the transfer fee. The company offers low exchange rates to its customers as compared to the mid-market prices. This is because it deducts the service fee from its exchange prices. You can get the Remit Money calculator here. So, Exchange Rate IQ provides its 7 out of 10 on for providing low exchange rates compared to real-time rates prevailing in the market. Transparency: Does Remit Money have any hidden fees? Axis RemitMoney does not charge any hidden fee from its customers. Users need to pay only the amount they can see in the calculator and the same will be received by the recipient. The company provides a unique transaction number to the customers regarding their transfer. So, they can check it on the RemitMoney transaction page. Exchange Rate IQ gives 10 out of 10 to RemitMoney for its transparency as it has been providing am easy tracking procedure as well as has no hidden fee. Transfer Speed: How long does it take to send money through Remit Money? 1. Instant Transfer: In this transfer, the company offers instant transfers in an hour to the customers who have uploaded the valid colored copies of the IDs such as a Social Security card, passport or driver’s license. 2. Internet Push Transfer: If you have not uploaded any ID, then Axis Bank RemitMoney offers internet push transfer, where the money takes typically two days to reach to the recipient. So, we provide 8 out of 10 rating to the transfer speed of the RemitMoney as it is transferring funds in an instant manner if you upload documents. Security : Is Remit Money Safe? Axis Bank is a third-largest bank of India and it is behind RemitMoney. So, it has been providing high security to the company which is certified by PCI-DSS. This means it has met stringent quality standards for data protection. It has its own internal corporate policy and procedures such as Grievance Redressal, Incident Management, Third Party Management, etc., so we rate its security 9 out of 10. Axis RemitMoney Transfer Company is a highly user-oriented website. It has provided many FAQs regarding various situations which customers face while transferring the funds. It has been providing the exchange rate calculator and also referral benefits to its clients. It also offers a 100% refund after the cancellation of the transfer within 30 minutes. About payment convenience, it only accepts bank and online transfers. So, those who want to transfer money through any other mode could not use its services. At the same time, it is available in a few countries for NRIs only, so other people out of these countries could not use its services to send the money. The company offer website transfers only. It does not provide the mobile apps for transferring the funds which is one of the major drawbacks. It also does not offer cash pick-up or courier services to its customers. They only can get the money in the bank account within an hour of transfer. So, to use the services of RemitMoney login here. 1. RemitMoney Referral Offer: The company provides various benefits on referring the services of it to other friends. It provides unique referral link, which you need to send to the friends and if they perform their first transaction, you will be given EUR 500 in your account as credits. RemitMoney offers various vouchers to its users on a weekly basis which will be offered them by the mail or SMS. 2. RemitMoney Promo Code: The company does not have any promo code but will provide you cash points when you use its services of “Invite and Earn”. These points can be redeemed once you collect 2000 points. As per user experience, we provide 7 out of 10 to RemitMoney as its services are available to few people only. This shows that it has vast opportunities to grow across the world to provide high-quality remittance services. Coverage: How many Countries & Currencies does Remit Money support? RemitMoney only offers transfers to India from various countries which include Canada, the United Kingdom, the United States, Australia, Singapore, UAE, South Africa , Switzerland and the Euro Zone. The service is only available for the NRIs and no other country resident can send the money through RemitMoney to India. Axis RemitMoney has been designed to provide specialized services to Indians residing in the above listed countries to transfer funds to India. So, we rate the company 7 out of 10 for its market coverage because there is high demand of such services across the world. Excellent service provided by Mohit Makwana & excellent followup for resolving my query. I am really impressed by help provided. I really like customer support after very transaction I got email for notifying me that transaction is done. Special thanks for personal call and help to Mohit Makawana and Mahesh. In my last remittance through RemitMoney I erroneously entered a '0' and submitted a transaction for CAD 9000 instead of CAD 900. It was a big deal and blunder from my side. But end of day we are still human and not an AI. It was an instant remittance and I only realized it after the money deposited to my Indian account and the worst part is the debit transaction didn't bounced and my Canadian account balance gone to negative as there were not sufficient fund available. The RemitMoney Customer service team was really responsive and helpful from the very moment I logged the ticket. The scenario was pretty complex and unique in nature and probably they also didn't have a reference case like this in past. But I kept my trust and patience through-out and followed all the instructions by them. They were very professional and put this case in high priority judging the complexity involved here and took 7 days to settled the whole case. It will be unfair if I ended here without mentioning Rahul's name. As a manager he was in constant touch with me for all my queries and showed superb co-ordination skill with all the team involved here. It was a lesson learnt from me as I still don't have any clue that how I did this, as I am a veteran remitter and doing remittance since 2010 from multiple countries. I will definitely share my good experience to my friends and colleagues. Lastly I will mention one thing that system could have handled this to avoid such pain as they are not human like us. I liked the customer support which was very helpful when I got stuck at one point during transaction. Mohit Makwana from customer support team was really patient throughout the process and really helped a lot and made sure to stay till it went through. Most awesome part was he also informed himself that transaction went through. I Iiked the entire experience. The transfer was immediate and was genuinely surprised by it. They had the best exchange rates compared to others. The customer service representative Sweety was very helpful, polite and ensured the transfer was smooth. S3 - Simply superb service. RemitMoney is simple, effective and reliable service for money transfer. It provides peace of mind while transferring large amount of cash from US to India account within few hours whereas other providers such as Xoom usually takes 3-4 business days. Thanks to RemitMoney for fantastic service. I am enjoying Remitmoney. Thanks for the customer service when needed. Representative Keziah Nadar (Customer Support Representative) has walked me through all the guide lines on right time. Aftab was very helpful in reversing a remittance transaction that I had performed accidentally. Within a couple of hours, he ensured that the appropriate team was contacted, followed up with them, had my transaction reversed and then called me back to confirm the successful reversal. I had a very good experince with Aftab in particular and Remit Money in general. Kudos! Highest conversion rate from USD to INR. Money transfer took less than 1 hr. Fantastic customer service as well. Will use them going forward. Very cool interface with easy steps to send the money. Money was received within 2-3 days from US. Staff was very responsive to my questions and support. Good job team, hope they clear any small hiccups in the website. Thanks Abhishek Jha for helping me out with my first transaction on RemitMoney. Keep helping. Thanks again. Very Excellent Service. Abhishek was very helpful to finish my transaction. He guided me through entire process though my computer was slow and was booting he waited for it and stayed until I successfully completed transaction. Also, he helped me to cancelled my previous transaction which I wanted to remove. As expected, my money would transfer to my Indian NRI account on time with help of Abhishek. Go to the website of RemitMoney. Click on “Get Started” in the mid of the home page. Here enter the login details, or if you are using the website for the first time then sign up. Enter all the personal details and colored pictures of your ID. Select if you have an Axis Bank account or not. Enter the bank details from which you want to send money. Enter the details of the recipient and his bank details. You can now enter the amount and know how much the recipient will receive in their currency. The recipient will receive amount in an hour.